HUTCHINSON — Going into the 2017 football season, Sabetha coach Garrett Michael had enough known commodities on the defensive side of the ball that he approached the year with a simple philosophy. “Run the ball, punt and let our defense play,” Michael said. Sabetha’s offense developed enough throughout the year that the Bluejay defense rarely was called upon to be the difference-maker. In Saturday’s Class 3A state championship game against Marysville, however, the defense had to deliver. Despite seeing Marysville take each of its seven offensive possessions of the game into Bluejay territory – many inside the red zone -- the Sabetha defense only gave up one score. And with its back against the wall in the final minute of the fourth quarter, the unit came up with the play of the game. Nursing a one-point lead and with Marysville at the Bluejay 6, Gabe Garber’s interception at the goal line denied the Bulldogs one last time and made Sabetha’s only touchdown of the game stand up. Sabetha’s 7-6 victory capped a 13-1 season for the Bluejays and delivered the program’s first state title since 1997. Marysville finished the year 12-2. Marysville’s opportunities were numerous as the Bulldogs out-gained Sabetha 340-122 in the contest. Repeatedly, the Bulldogs drove deep into Sabetha territory. Just once, did they find the end zone, a 16-yard touchdown pass from Jack Blumer to Gabe Pieschl late in the first half that gave Marysville a 6-0 halftime lead. But three turnovers proved to be killers for the Bulldogs, none bigger than the final one. Taking over at its own 30 with 5:33 left in the game and converting a fourth-down at its own 39, Marysville methodically drove down the field with precision short-game passing from Jack Blumer. The Bulldogs converted on third down three times, including a huge 19-yard completion to Gabe Pieschl that gave the Bulldogs a first down at the Sabetha 17. Two plays later, Marysville had a first and goal at the Sabetha 6 and a Bluejay defense which had turned back the Bulldogs all day needed to come up big again. In last week’s semifinal victory over Silver Lake, Garber made a great read to pick off a pass in the flat that all but wrapped up Sabetha’s 17-14 victory over the Eagles. Saturday against Marysville, he did it again, stepping in front of Blumer’s pass to the end zone for Brennan Wetter at the 1 and coming up with the game-winning interception. Sabetha found stops not just at the end, but the entire game. Marysville’s first drive of the game saw the Bulldogs move to the Sabetha 40 before Joseph Gruber snagged a Blumer pass intended for Pieschl at the 10 to deny the Bulldogs a quick early score. It was the first of three turnovers for Marysville, which had 22 first downs to just 10 for the Bluejays. Sabetha also stripped Pieschl and recovered the fumble at Bluejay 13 early in the fourth quarter and then got the game-clinching pick at the end. Marysville nearly did thanks to a defensive effort that almost completely stymied one of the state’s top ground games. Entering the game averaging more than 340 yards per game on the ground, Marysville held Sabetha to just 122 total yards, almost a fifth of it coming after a bad snap on a punt. Sabetha had just one drive which covered more than 20 yards, but it was enough to produce the Bluejays’ only touchdown of the game. After being held to just 51 yard in the first half, the Bluejays opened the second half with a six-play, 51-yard drive capped by a Wyatt Beyer 8-yard touchdown run with Braeden Cox adding the game-deciding extra-point kick. Blumer finished throwing for 225 yards and a touchdown and also ran for a team-high 81 yards. Gruber led the Bluejays with 91 yards rushing. 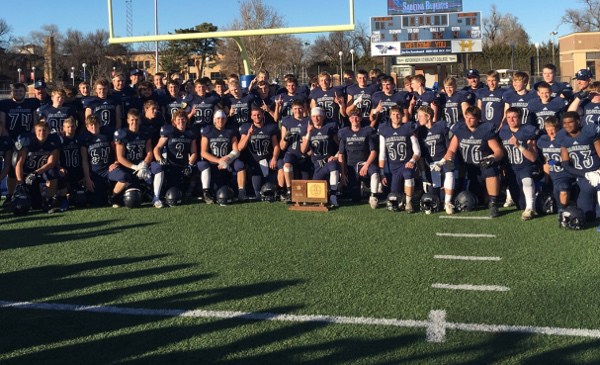 The championship was the third in Sabetha history and the first since the Bluejays captured the 1997 Class 4A state title with a 14-13 win over Louisburg. RUSHING — Marysville: Blumer 17-81, Roever 7-24, Hornbeak 4-11, Backus 1-minus 1. Sabetha: Gruber 18-91, Garber 6-32, Beyer 7-28, Oehm 1-5, Hackney 2-3, Brownlee 2-1, Engelken 1-minus 2, Team 3-minus 36. PASSING — Marysville: Blumer 28-39-2, 225 yards. Sabetha: Brownlee 0-1-0, 0. RECEIVING — Marysville: Backus 14-112, Pieschl 5-64, Lindhorst 4-26, Hornbeak 3-16, Rader 1-8, Roever 1-minus 1. Sabetha: None.